I know, I know, your home party plan merchandise sells itself. I’ve heard that a million times from my direct sales clients and friends and I believe it…to a point. It’s partially true because the products you sell are generally the highest quality available and because of the environment (namely a home party where everyone is having fun) at which you’re selling them. What I also recognize is that those in direct sales use that as an excuse to be lazy at the end of their home parties and become order-takers instead of sales people. Sales is not a dirty word, and if you’re not employing some selling techniques with your customers and host, you’re not only missing out on a larger home party sales average (literally leaving money on the table), but you’re also depriving them of the opportunity to own more of your awesome products. Personal sales from your home parties are always a great way to supplement your income, and this time of year you can literally double and triple your sales because of the extra parties you’ll be doing and all of the holiday shopping that’s coming up in the next few months. 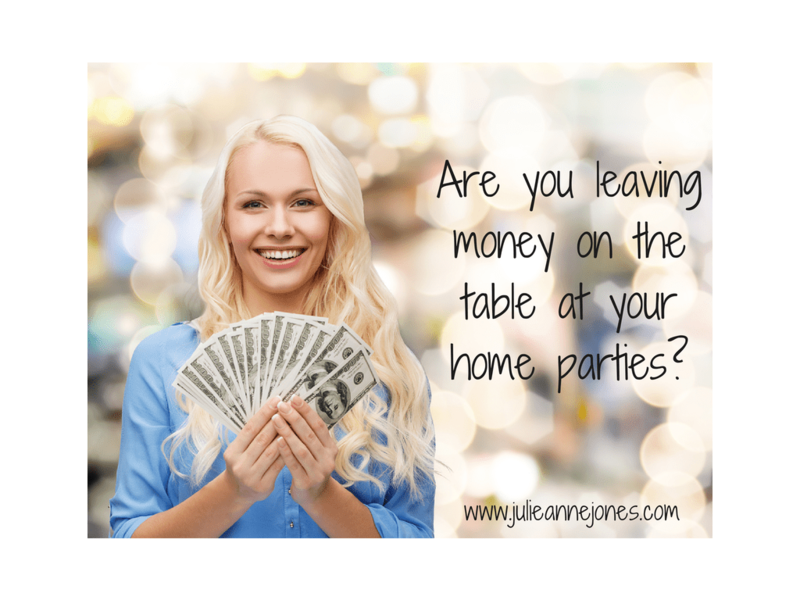 Here are a few of my best tips for maximizing your sales at the end of your home parties. Use a Wish List during your presentation so your guests can keep track of the items they like and you have a clear way of knowing what they’re interested in when you sit down to help them with their order. Intentionally set up the shopping portion of your presentation at your home parties. That means telling them what’s going to happen next, handing out catalogs, outlining host and customer specials for the current and next month, and sharing logistics like methods of payment you accept, how their orders will ship, etc. Provide a Nordstrom, not a Wal-Mart experience for your guests. Your goal is to be of service, so tell them it’s your intention to sit down with them and help them obtain the most value for their dollar by helping them place their order. This one direct tip alone will increase your average order, because you can employ the below tips as you’re sitting and helping them. Make suggestions based on your guests’ Wish Lists. Your job is to know your merchandise and catalog so well that you can suggest add-on products based on what your customers like (it’s called upselling). A high percentage of people will say yes to relevant suggestions, increasing your bottom line. Incorporate your Guest Special (if your company offers one). It’s always designed to increase your sales, so make sure you understand exactly what it takes for your guests to earn it and make it your goal to “get it” for every guest who orders. Use Party Packages to make ordering easier for guests who are in a hurry or have a hard time making a decision. Party Packages are simply groups of your products that you offer as a set (but NOT at a discount). You can click here to read more blog posts and direct sales training tips about home party plan sales. Do your homework and get this area of your home parties “figured out” before you step into the next few months. It could earn you enough extra cash to pay for all of your holiday gifts!